Walking into a Pilates studio for the first time can be daunting. A quick glance around will reveal a variety of odd-looking apparatus, but you may wonder how your body could actually engage with them. When you dress for a Pilates workout,first, make sure your clothes ‘give’ enough to let you move and stretch fully. Your instructor will need to be able to see your body well enough to see the alignment of your bones and how your muscles are engaging – so while loose is OK, baggy is not. You will not need footwear in the studio although for hygiene and gripping on the apparatus we do suggest TOESOX that can be purchased at the studio. However, Pilates can be done barefoot. Our beautiful studio space is fully equipped with Professional grade Stott Pilates Reformers, Cadillac , Stability Chairs and Ladder Barrel to accommodate a variety of Pilates classes, workshops and bodywork. 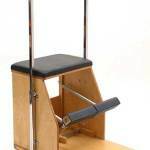 What you learn on one Pilates’ apparatus you can perform on all of the Pilates’ apparatus. There are essentially four planes of movement; flexion, extension, lateral flexion, spinal rotation. Movement can incorporate a combination of moving in different planes. The ladder barrel is a great tool for stretching and to open up the spine. A staple of every well-equipped Pilates facility, the Cadillac offers an extensive range of applications for everyone from post-rehab clients to athletes. This ultra-sturdy, versatile unit will add more than 200 exercises to your Pilates repertoire and challenge clients in different planes of motion. The trapeze table, also known as the Cadillac, is based on the first piece of equipment designed by Joseph Pilates. When Mr. Pilates was working as an orderly at an Army hospital in Britain during World War 1, he attached springs to metal bed frames and created an exercise machine for his patients. As the concept developed, Mr. Pilates added a full frame around the table and several spring attachment points to provide varying angles of resistance for a wide range of exercises. (with handles) is a multi-functional Pilates apparatus that can be adjusted to train most muscle groups. This sturdy piece of equipment helps the exerciser achieve upper- and lower-body strength and conditioning, enhance stability and improve body control. Ideal for rehab clients or those who need to stay in a seated or upright position, helping re-balance muscles while providing a full-body workout. It also facilitates high-performance exercises for athletes and fitness enthusiasts. The chair is based on the original which was designed by Joseph Pilates for his clients who lived in small New York City apartments. It was literally an exercise machine that could be converted into a chair and put into a living room! There are over 25 different exercise categories on the Chair focusing on core strength, leg strength, shoulder girdle stability, mobility and strength and functional movements, such as standing, climbing, pushing and lifting. Invented by Joseph Pilates, the reformer is a bed-like frame with a flat platform on it, called the carriage, which rolls back and forth on wheels within the frame. 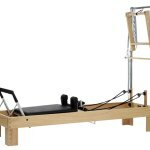 The reformer is the main machine in Pilates based resistance training. 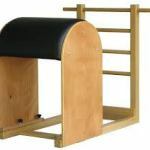 The system of the Reformer is made up of springs, loops, a gliding carriage and a bar which challenges body and mind. The resistance is created by the combination of springs and one’s own body weight.